The Chinese smartphone-maker Huawei has won a patent victory over its South Korean rival Samsung. A Chinese court in Quanzhou has ordered the Galaxy S8-maker to pay 80m yuan ($11.6m; £9.3m) to Huawei for infringing the firm's smartphone cellular technologies. The two are also suing each other over patents in other courts. 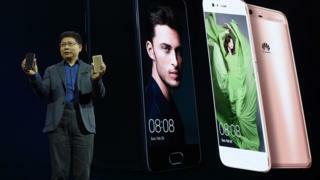 Huawei's victory was tempered, however, by news that it could face a sales ban in the UK. Huawei launched the legal action against Samsung last May and has subsequently followed with other claims filed in its home city of Shenzhen and California, covering more than 10 patents. It has alleged that more than 20 models of Samsung's phones and tablets make use of its technologies without permission. Samsung countersued in July over six alleged infringed patents, saying it had attempted to resolve the dispute "amicably". Huawei was the world's third-bestselling smartphone-maker in 2016 and Samsung the first, according to market research firm IDC. Although intellectual property disputes that pitted one tech giant against another were common a few years ago, they have been fought out of the public eye in more recent times. Even so, many of the details of the latest case were redacted by the court because of commercial privacy concerns. "Huawei notes the court's decision in this case," a spokesman told the BBC after the verdict. "Huawei believes that respecting and protecting the intellectual property of others enables all companies to make a return on our R&D investments. We maintain that respect for intellectual property promotes innovation and healthy, sustained growth in the industry." A spokesman for Samsung said it intended to review the court's decision and would decide its response later. "Over many years, Samsung Electronics has pioneered the development of innovative mobile technologies through continuous investment in R&D to provide consumers with a wide selection of innovative products," he added. The Chinese ruling coincides with a judgement from the High Court of England and Wales that Huawei must pay a US firm a global fee for its 4G patents or face a local sales ban. The owner - Unwired Planet - had acquired the inventions from Ericsson. It does not make products itself and has been referred to in the past as being a "major patent troll" because of its efforts to extract payments from those who do. The Nevada-based company is also suing Samsung, Google and Apple. Huawei had argued that the amount being sought by Unwired was too high, which the court agreed with, so it still views the ruling as being a partial victory. "Huawei is still evaluating the decision as well as its possible next steps," said a spokesman for the firm. "Huawei does not believe that this decision will adversely affect its global business operations." However, a lawyer for Unwired Planet also viewed the case a win for his client because Huawei faces having to compensate the firm for sales worldwide. "Until now there has been a view that even if the infringing party is successfully sued, at the end of the day they would have to pay no more than the royalty rate they would have had to pay anyway, and only for the countries in which they were sued," explained Gary Moss from EIP. "That gave an incentive for implementers to hold out in the hope of achieving a more favourable royalty rate. Today's judgement confirms that this need not be the case."